I am a retired teacher, education teaching 30 to 40 years, the disease has many : hypertension, coronary heart disease, cervical spondylosis, lumbar disc herniation, gastrointestinal, renal calculi, hemorrhoids, constipation, many sick and is a worse death than. Recurrent dizziness, headache, insomnia, low back pain, lower extremity numbness symptoms, life difficult for themselves. Long-term medication, injection, cleaning does not spend less money, not cure illness. 1. To adhere to the study. To see more of these books Meridian Point area, to clear passages, Acupoints distribution and other aspects of the disease, the only way to know what kind of disease which Acupoints used to treat and cure will handy, easily. 2. To uphold the day listening to the radio, listen to the company's Director Zhou expert lectures and fellow Bluelight treatment with the experience, and do a good job Notes. 3. 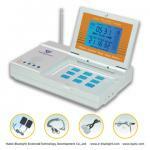 Daily use Bluelight therapy for the treatment of the Eight Diagrams 2-3 times, not stopped. Ill treatment, disease-free fitness and daily drinking water and using activated reflexology foot foam hands and persevering process. My little grandson, 4 jingle was recorded as follows: "Bluelight into my house, all music is concerned; Pop magical, and it will never away from!"